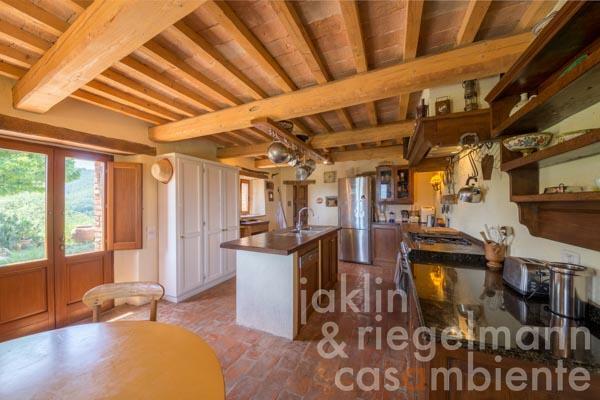 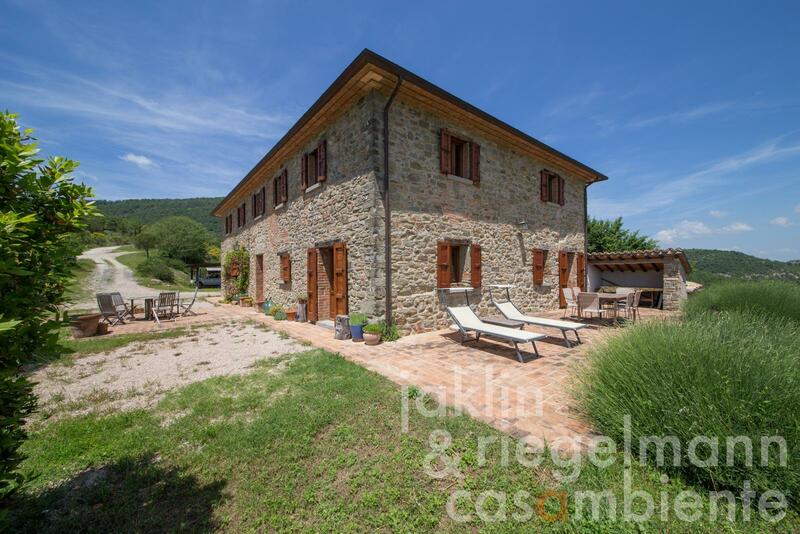 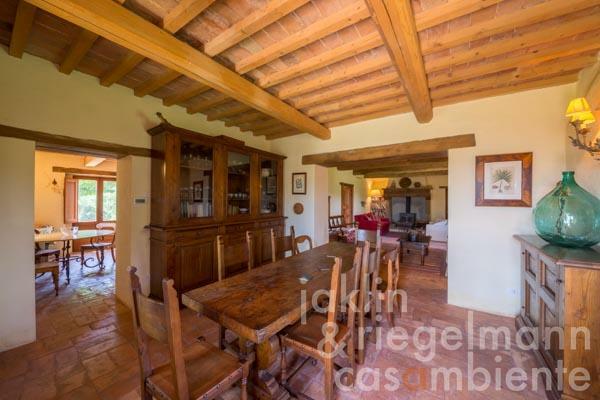 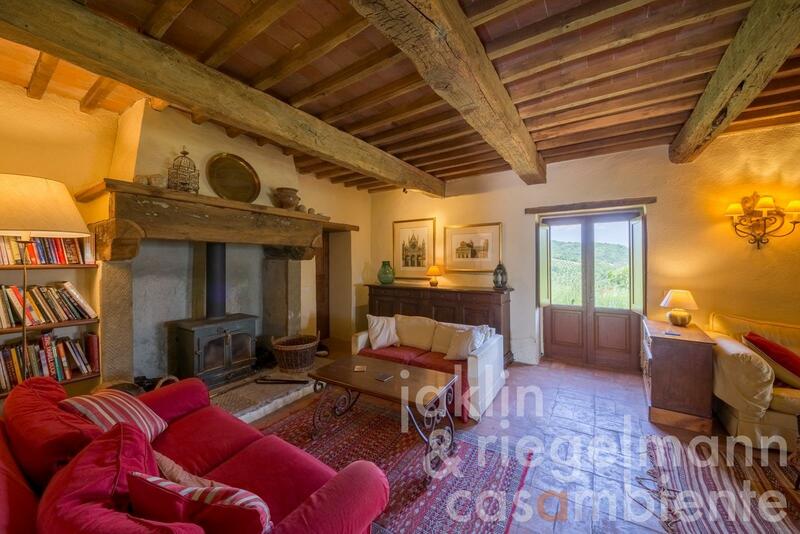 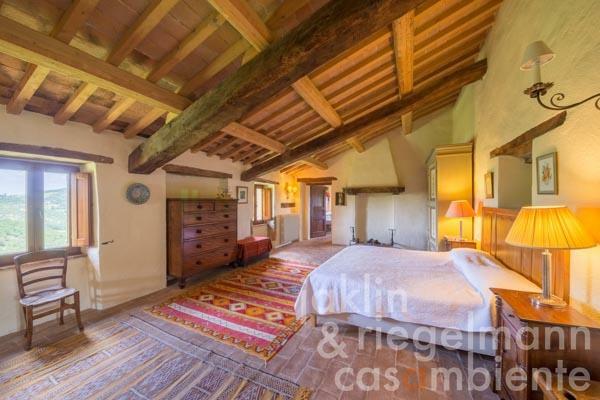 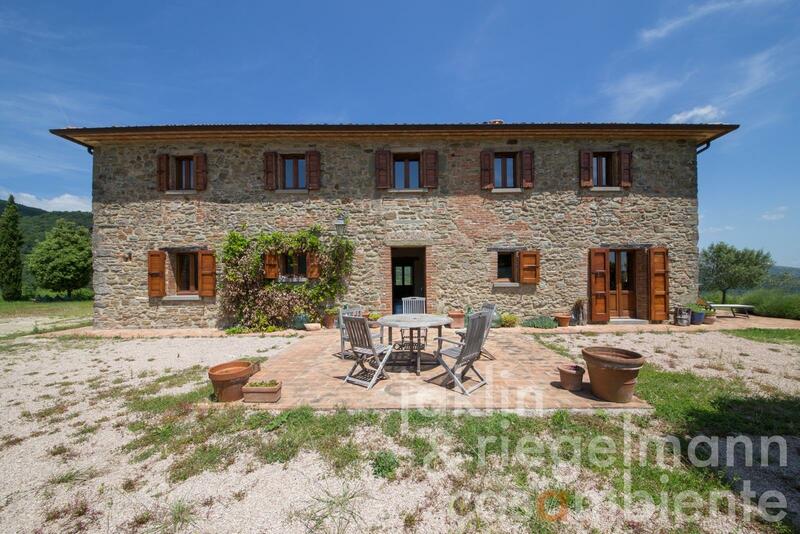 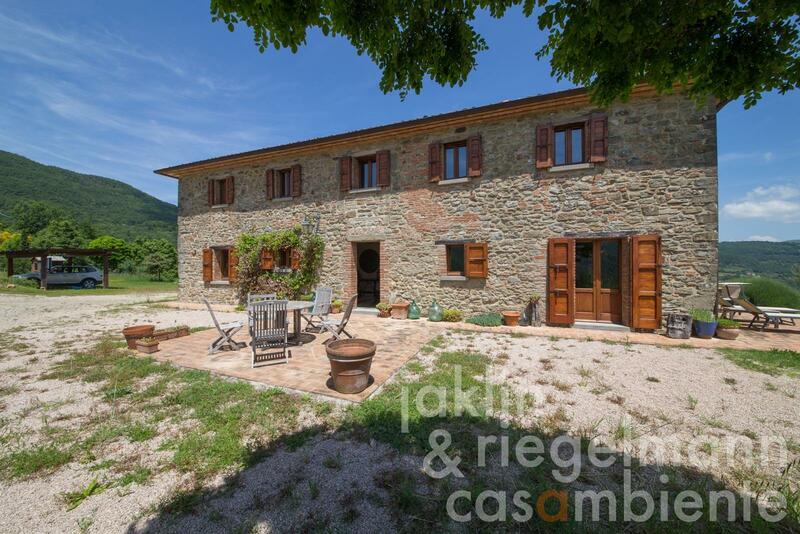 This Italian farmhouse for sale is set on approx. 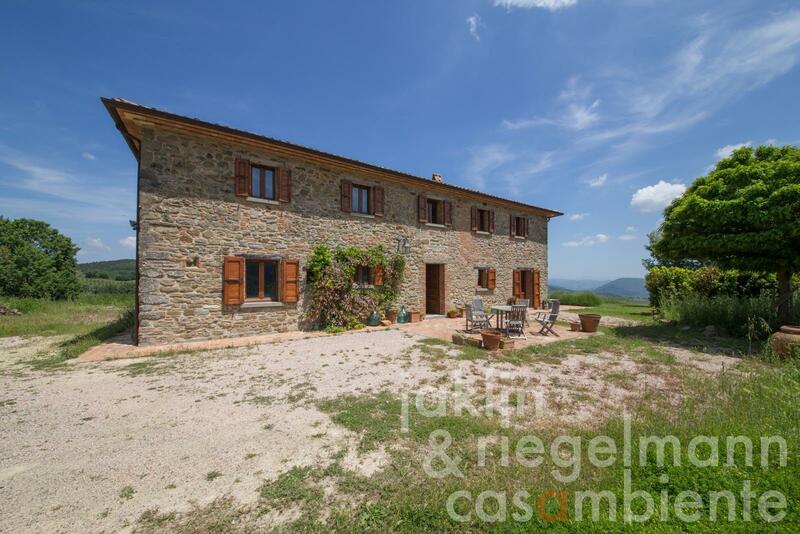 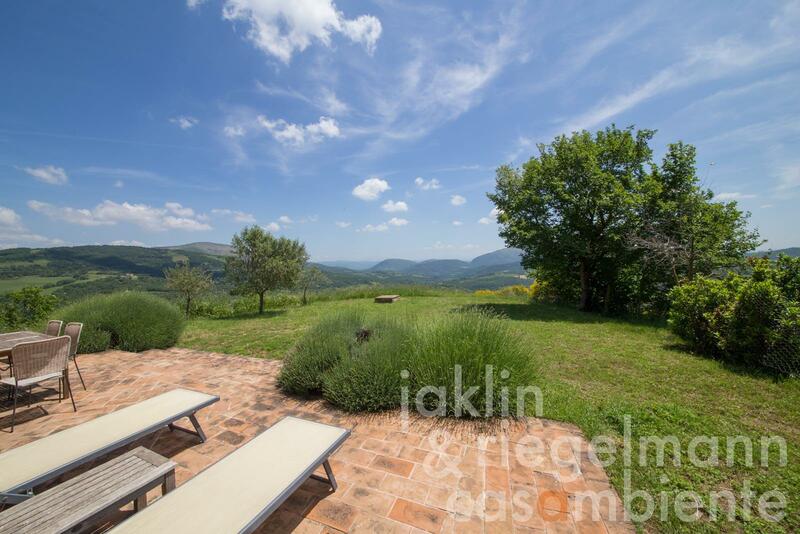 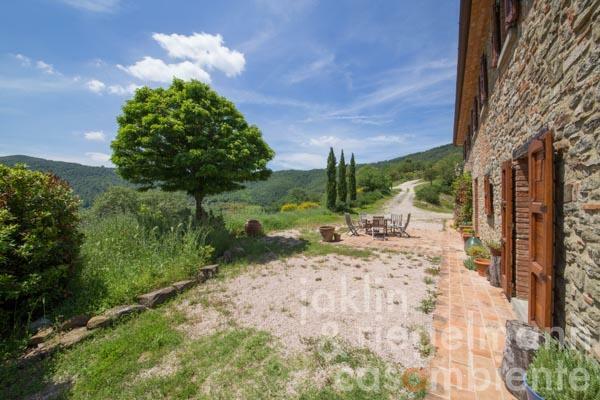 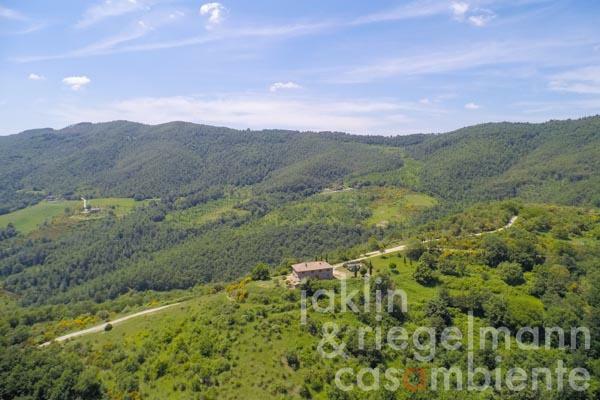 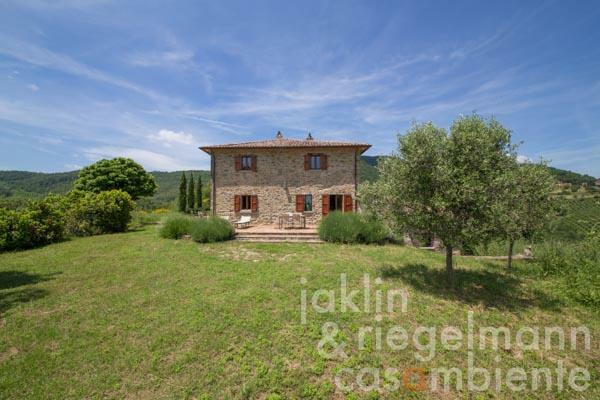 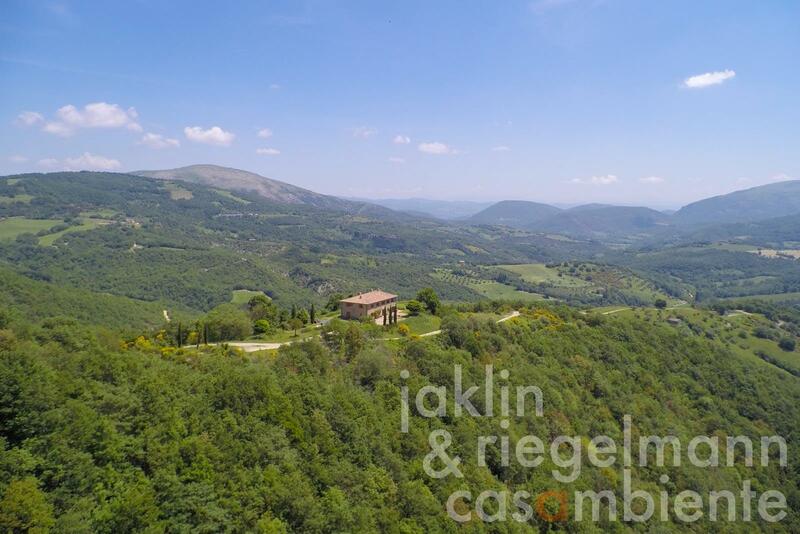 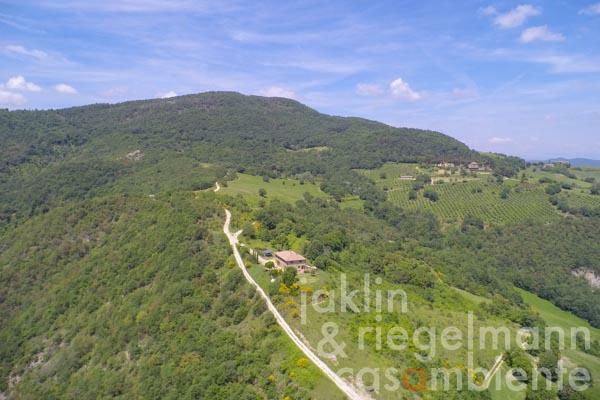 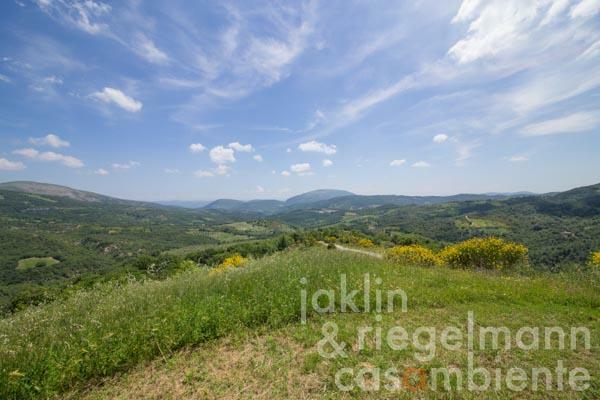 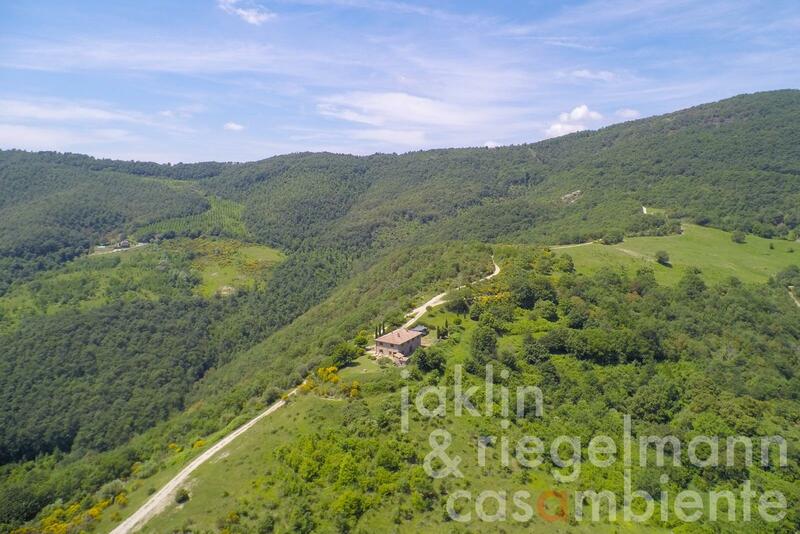 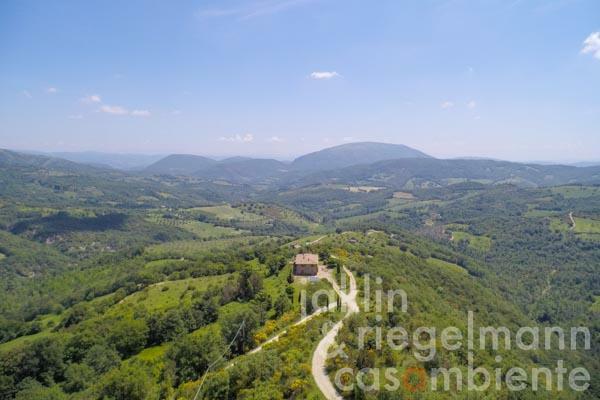 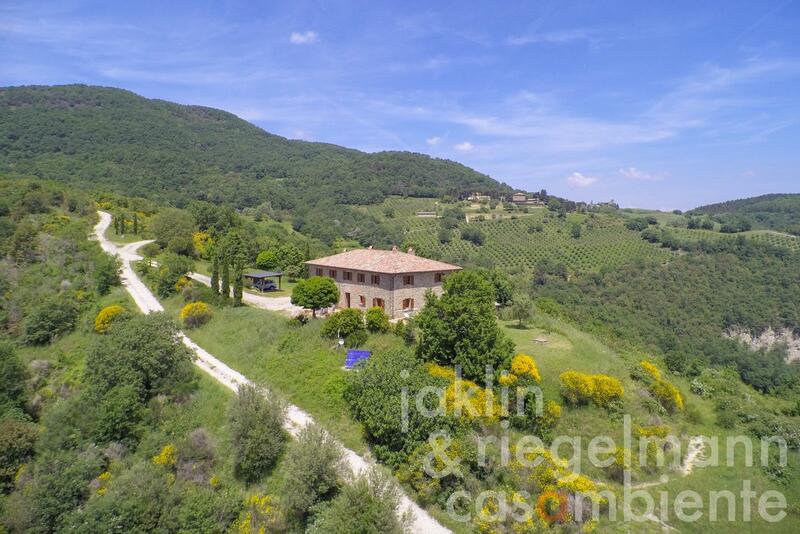 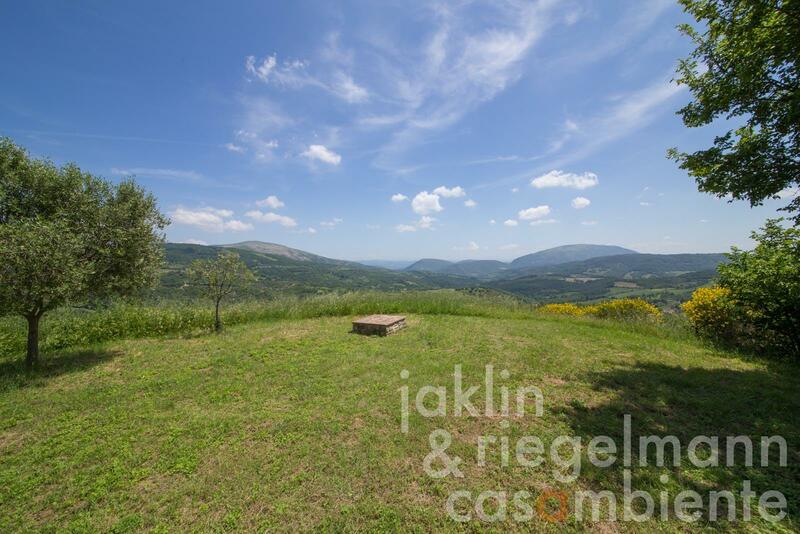 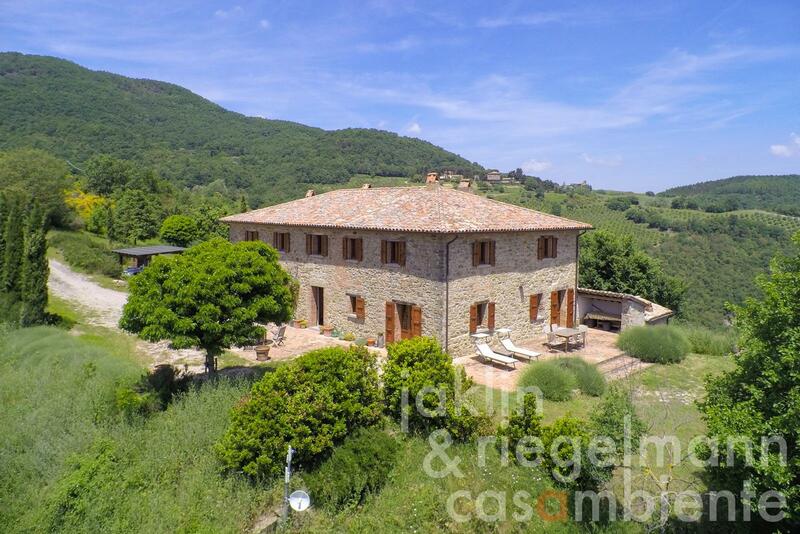 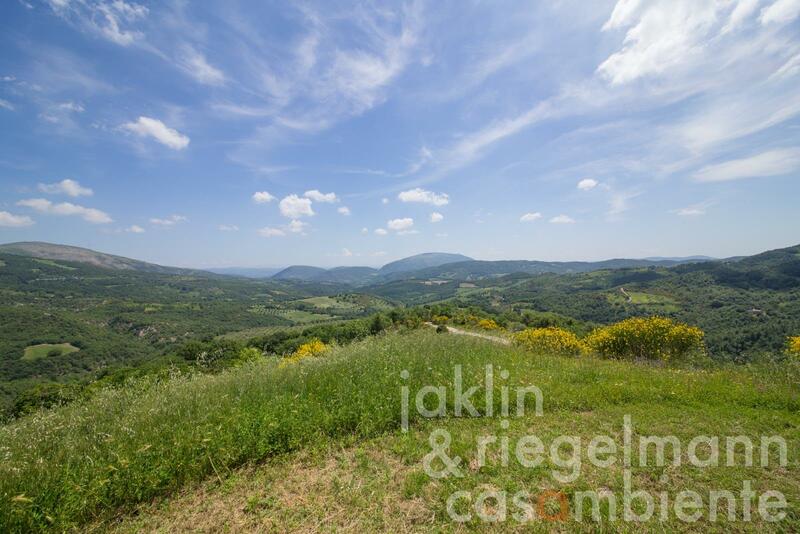 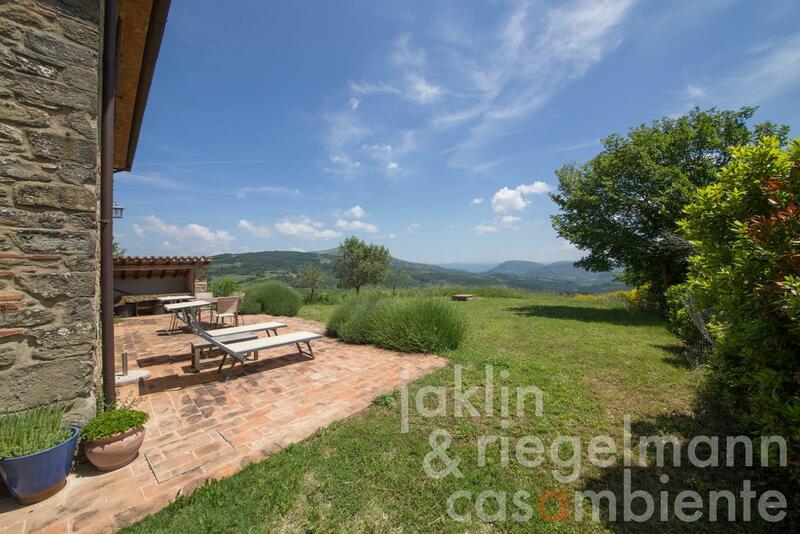 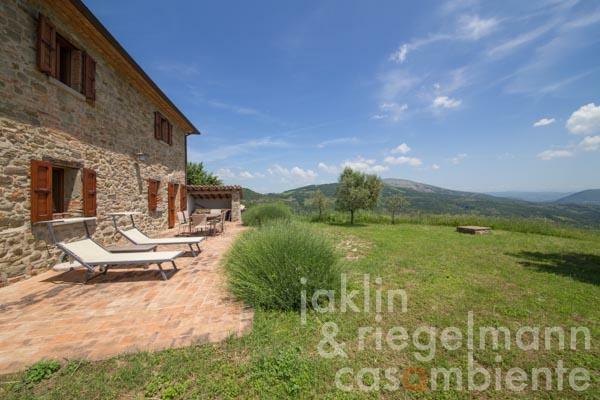 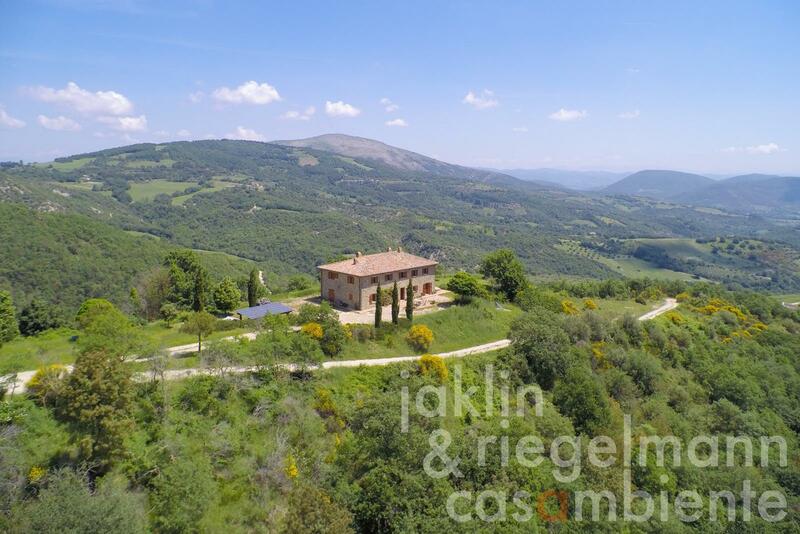 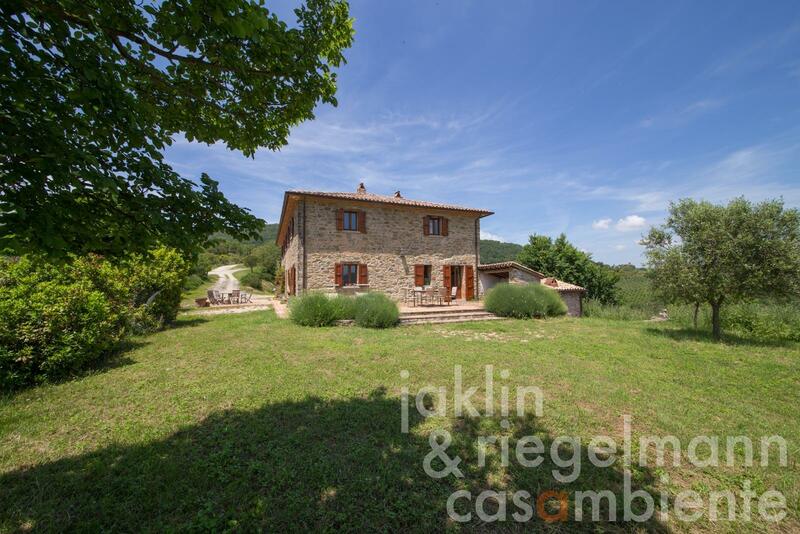 12 hectares of land close to Umbertide in Umbria with fabulous 360° panoramic views. 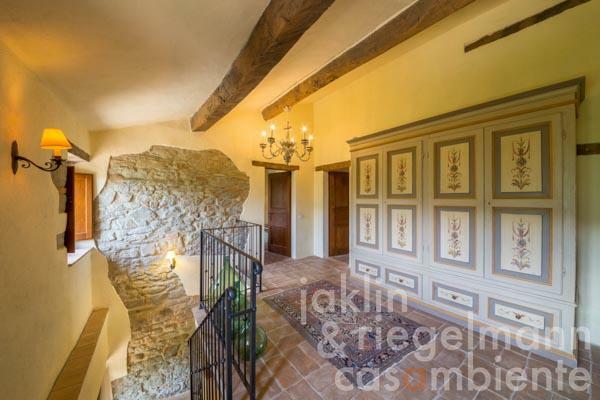 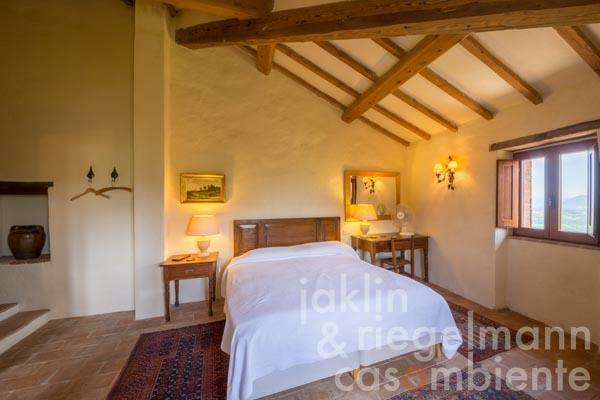 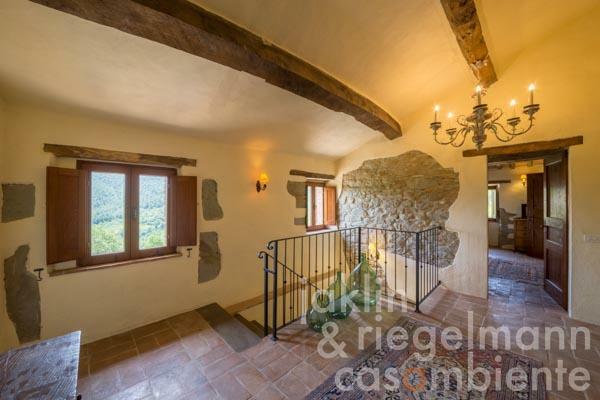 The property was restored to a very high specification a few years ago, using traditional building materials like marble and stone, wooden beams, terracotta tiles, and rustic heavy doors. 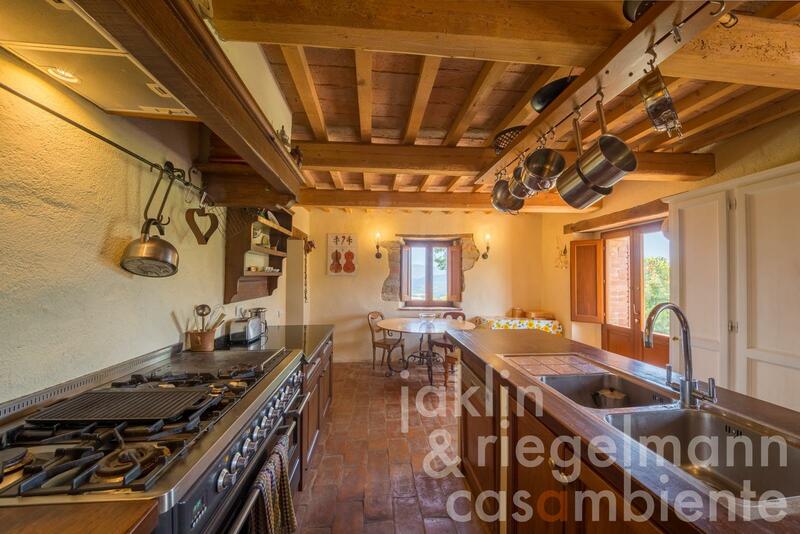 Stunning Florentine handmade metal light fittings throughout add to the character of this comfortable house. 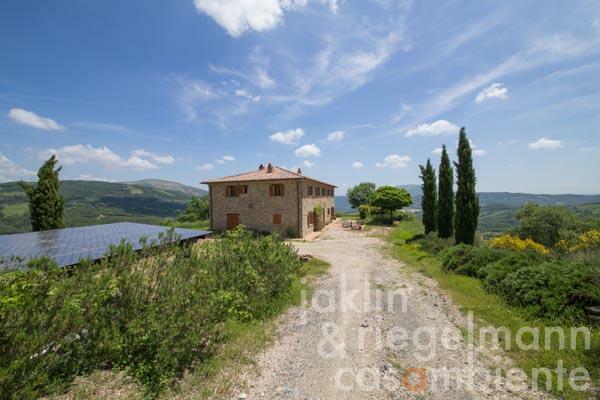 Total energy expenses are currently below zero thanks to 4.6 kW of photovoltaic panels on the carport. Ample hot water and heating are provided by Thermomax solar panels, a Clearview wood stove, and a rarely used gas boiler. 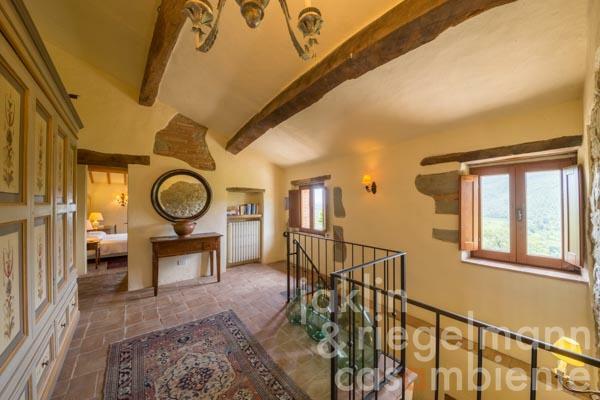 There is underfloor heating throughout the ground floor and radiators in the bedrooms and bathrooms upstairs. The windows are all hardwood double glazed with internal and external shutters to keep the house cool in summer and warm in winter. The ground floor offers a large entrance hall with a polished stone floor to match the staircase leading upstairs. 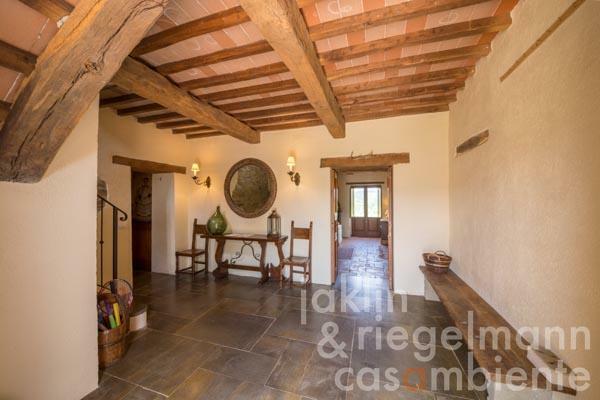 The living and dining area combine through a large arch and create a spacious entertaining space with a rustic wood and stone fireplace at one end and doors to the east terrace at the other. 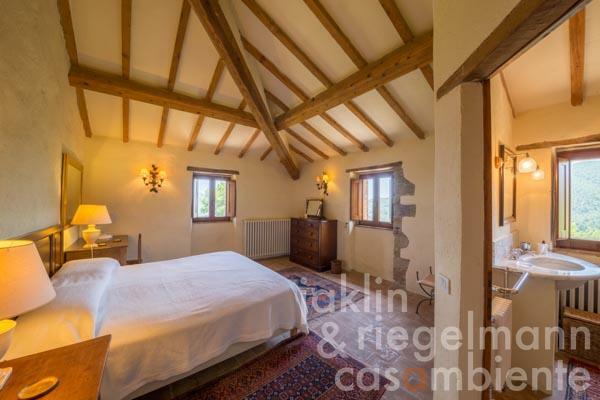 The study, leading off the reception room, has an original wood panelled ceiling and wooden bookshelves, and could easily be converted into a fifth bedroom. 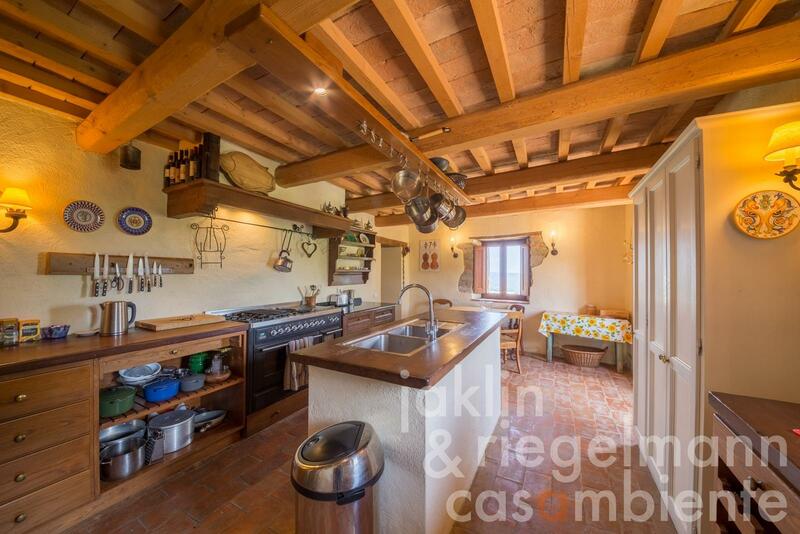 The eat-in kitchen is a proper cook’s kitchen with extra deep hardwood and granite bench-tops, plenty of storage in drawers, shelves and cupboards, and additional power points for appliances. Also on the ground floor are a laundry room, lavatory and utility room. 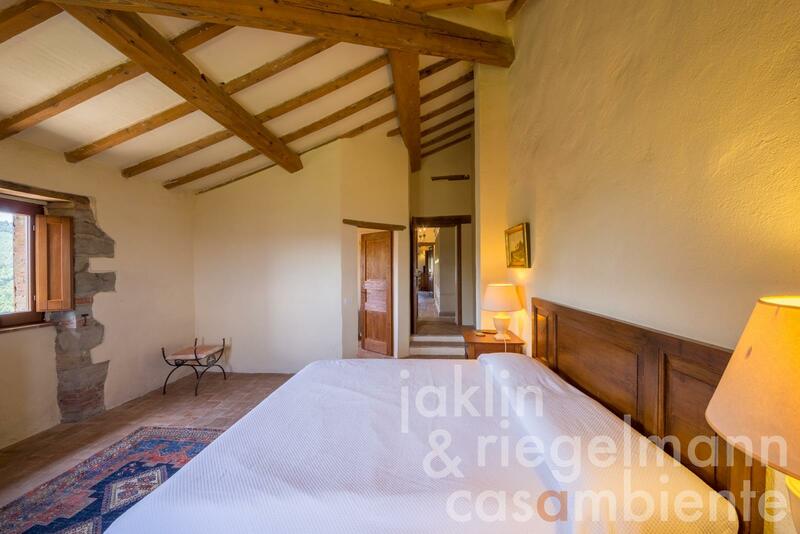 The first floor offers an unusually spacious master bedroom suite with original fireplace, luxury bathroom and an attached additional bedroom, study or dressing room. 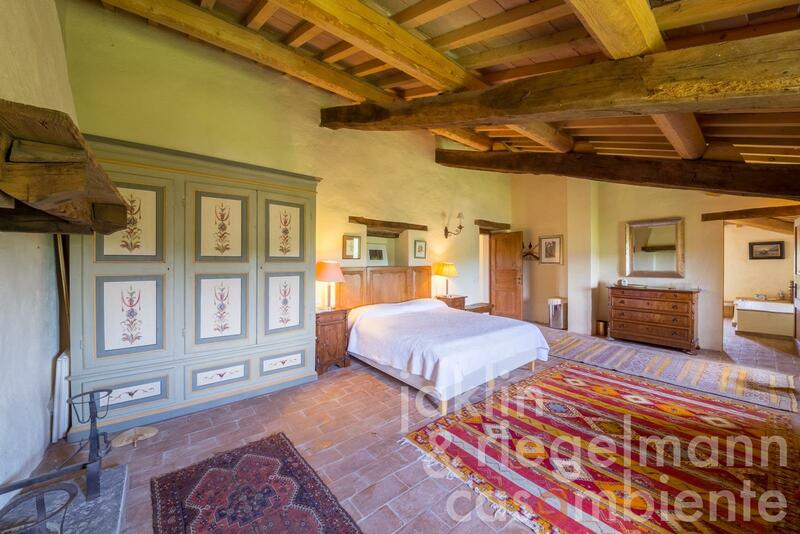 Two further large double bedrooms, each with an en-suite bathroom lead off the large landing, which has a large and beautiful linen cupboard. 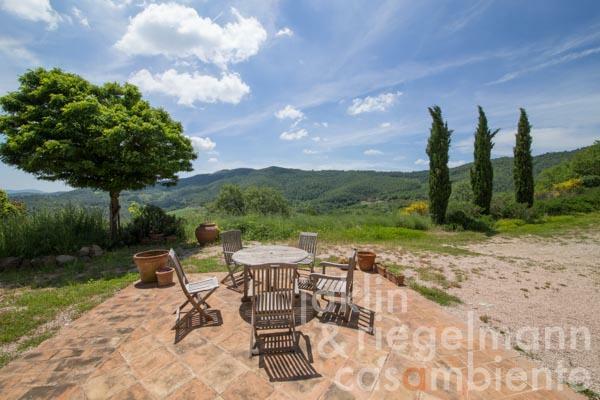 The surrounding garden has olives, cypresses, and woodland. The water supply for garden irrigation comes from a large pond up the hill, which is part of the property. 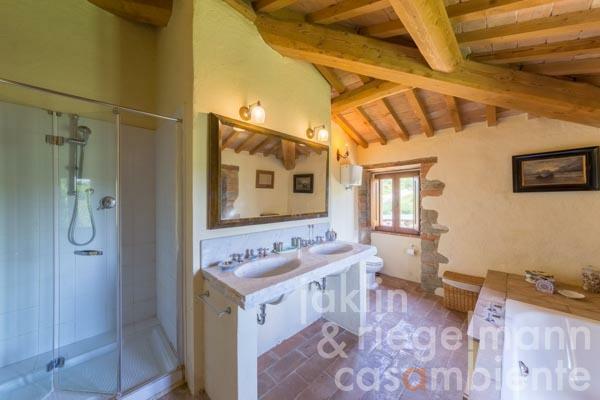 A deep well provides quality water for domestic use. 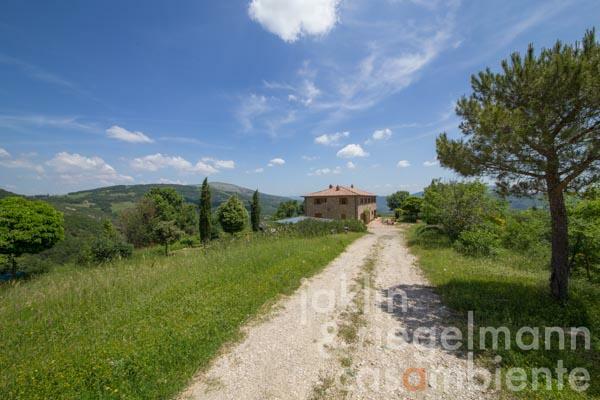 The property is accessed via approx. 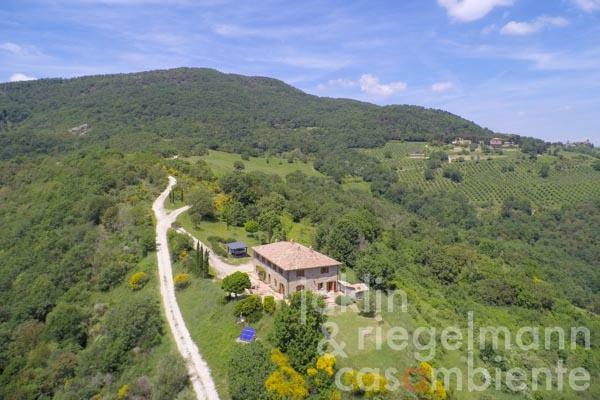 750 meters of white road, setting the house very securely within a gated and fenced estate. 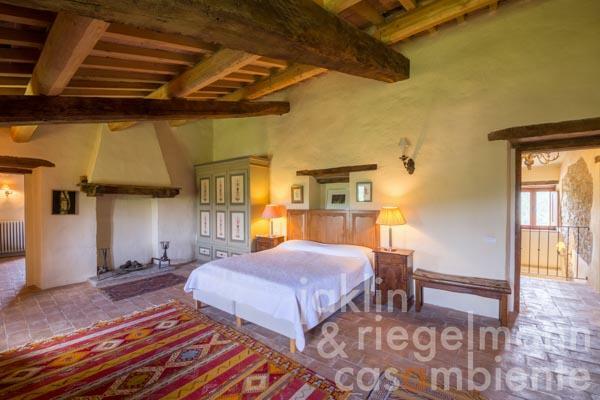 The charming local village is famous for the annual chestnut festival and the open air opera. Other nearby attractions include Gubbio, Cortona, Anghiari, Sansepolcro, Arezzo, Assisi and Perugia. Golf at Antognola is 20 minutes away. Lake Trasimeno with restaurants, beaches, ferries and sailing is easily reached in approx. 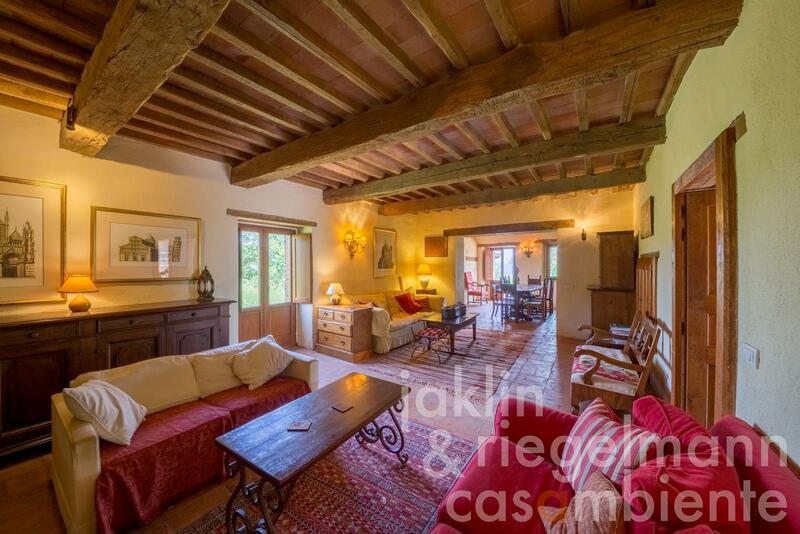 20 minutes along with trains to Rome and Florence. 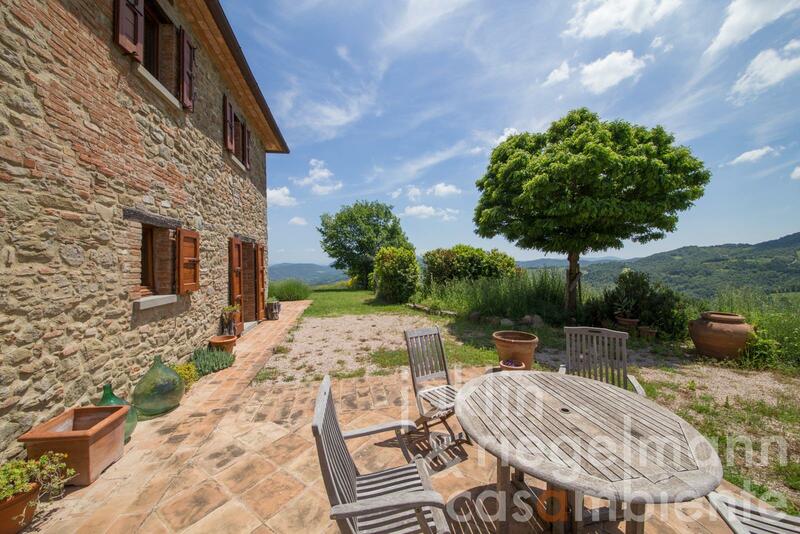 The historic town of Umbertide has a vibrant marketplace and supermarkets. Perugia airport is just 40 minutes from the house via the E45 motorway. Distances: Antognolla Golf 9 km; Preggio 10 km; Umbertide (all amenities) 15 km; Lake Trasimeno 20 km; Perugia 25 km; Città di Castello 38 km; Cortona 41 km; Assisi 55 km; Arezzo 82 km. 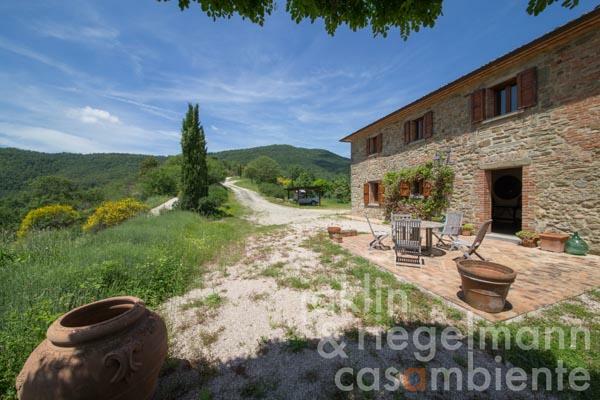 Airports: Perugia 40 km; Ancona 140 km; Florence 170 km; Rome 230 km. 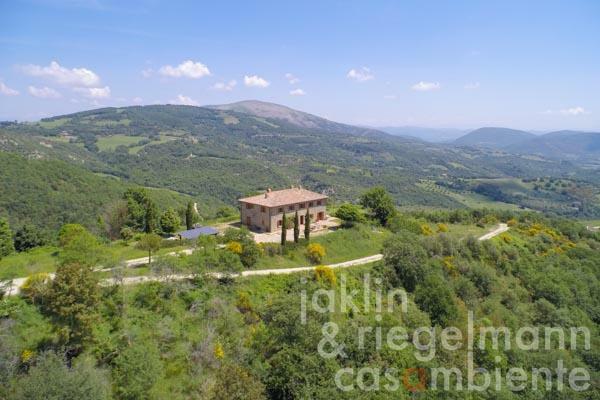 Italy, region Umbria, province Perugia, municipality Umbertide. Electricity, photovoltaic modules, own well water, central heating, solar thermal system, underfloor heating, fireplace, gas tank, broadband internet access, irrigation system, carport, private parking, terrace, garden.